Yes, for today’s Friday Funny, we have even more proof that the end of the world as we know it is probably just around the corner. The Atlantic ran a short bit this week about how birds incorporated diacarded cigarette butts into their nests. It turns out to have some unexpected benefits for the birds – evidently some of the chemicals I the butts keeps certain mites and other pests out of the nests. That image of the bird smoking is pretty funny and sad, you must admit. 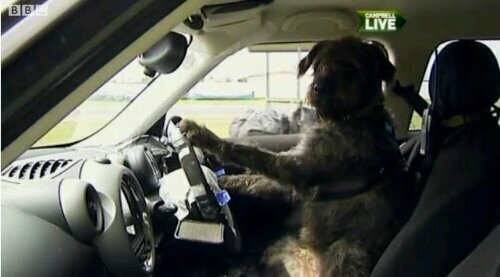 Next up, from our Paris bureau chief, driving school for dogs. 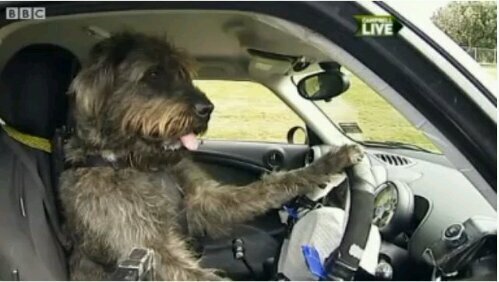 Someone in New Zealand is teaching dogs – such as this giant Schnauzer – how to drive a car. How are we doing over there, dog?